I can definitely see myself listening to this a good bit in the near future. Though it’s decidedly poppier than the Kids’ previous efforts, it maintains enough of their edge to be very listenable. There’s still some of that signature CWC guitar to be heard, but what will keep me coming back is Nathan Willett’s voice, because it’s awesome. I also just found this, which is interesting. Yesterday, the video card on my laptop died. So I most likely will not be making any new posts in the near future. Not that I would have anyway. Though today I listened to the new Cold War Kids album for the first time and wanted to put up a download link/share my thoughts. There won’t be a download link, but so far I think most of the album is pretty forgettable. Many of the songs have lost the edge that made Robbers & Cowards so awesome. Though there are still some good parts, such as “Bulldozer,” which to my ears sounds like the best song on the record. I really wanted to put up a little streaming thingy for it, but when I try to use my computer it turns into a crazy flashing mess. Epileptics stay away. I figured that someone would have posted all of the songs to youtube by now, but for some reason the one person who was posting all the songs from the record decided to leave out a few songs, including “Bulldozer”. So you get nothing. Anyways, Apple is supposedly fixing my poor computer for free, so hopefully it will be back and operational by the weekend, just in time for some Saturday Voxtrot lovin’, perhaps. The Low Keys were a rock sensation hailing from Abington, Pennsylvania. 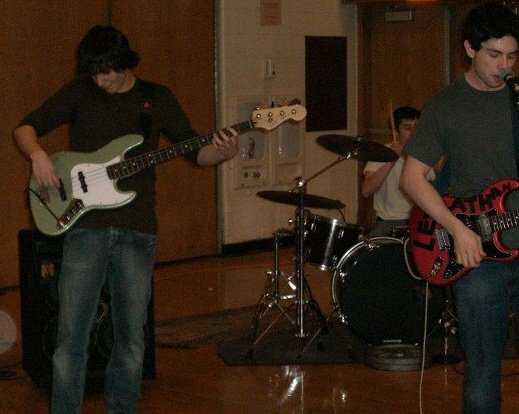 Their popularity peaked at Abington High School’s 2007 Battle of the Bands, in which they received first prize and were subsequently featured on AMPTV, shown on millions of TV’s all over the Delaware Valley. As with many great musical acts, their career was much too short. As college came and band members were separated, they moved on to new musical projects. 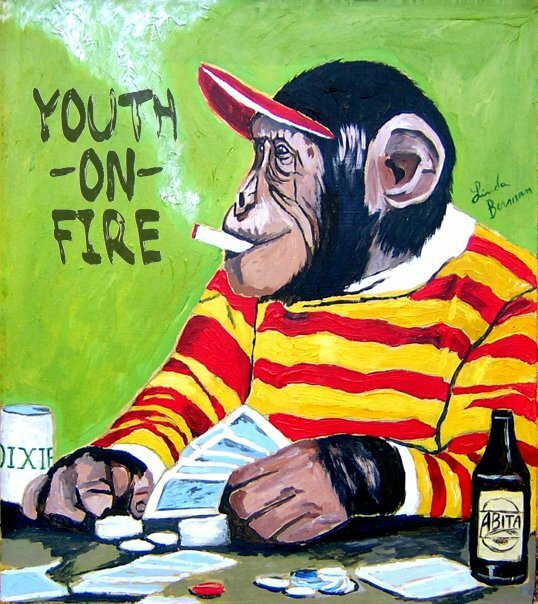 Youth On Fire is comprised of two monkeys. I told it to have “Hotel Chelsea” on there, because that’s my favorite, but who knows what’s really going to happen. Also check them out on ReverbNation, Facebook, and now even Twitter. Their first demo is entitled “Oh, Hi” and they’re sure to be playing shows in the Ann Arbor area soon, so keep your eyes and ears open for big things. The bass from The Low Keys, Brett Schupack, has also moved in a more electronic direction, though in a much different way. 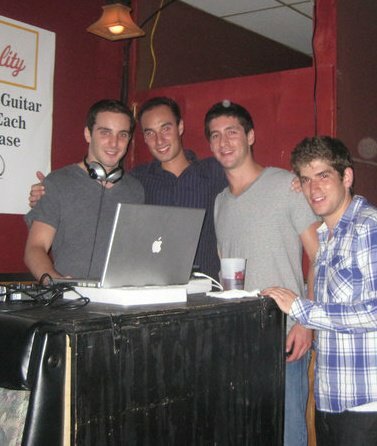 He is now a well-known DJ almost statewide. Currently hailing from Pittsburgh, DJ brett SCHUPACK has released a legitimate mixtape and DJ’s legitimate places. You can call him DJ Breezy Fresh, Brizzmaster Flex, DJ Big Brett, DJ Shoe Pack, DJ Breezy Fly, or Boom Boom Brizzy. So there you have it. A band splits at the height of their fame, only to spawn two even more promising musical ventures. Don’t be surprised when they’re all famous in a few years and you can tell all your friends that you were a fan way back when. I for one am hoping Youth On Fire and DJ Beep Boop both make it big, only to reunite later and create some crazy club bangers filled with intimate lyrics. As DJ Brizz Brizz says: Listen to it loud. Listen to it often. Well blog, I did it. A real post. I’d be lying if I said I’ve been too busy to post, as I did pretty much nothing over my winter break. I’m going to chalk up the lack of posts to the fact that I didn’t really get to listen to too much music over the last month or so and lacked writing inspiration. Now that I’m back at school and need to procrastinate from doing actual work, real posts should come with more frequency. I’ve never seen an album sampler thing like this before an album is released, but I think it’s a great idea. It’s gotten me super excited for Mind Bokeh, a new album from Bibio, also slated for a March release. It seems like March has been a good month for music. More need to do these album sampler videos. New post later today? Or tomorrow? Hi blog, sorry it’s been a while. I promise to have real posts soon.